Imagine tasting a delicious bowl of Ice Cream or enjoying a refreshing drink under the shade of swaying palm trees as you take in the spectacular Atlantic ocean views. 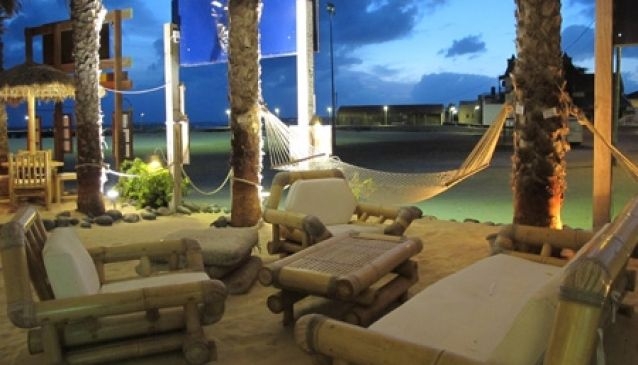 Feel the sand amongst your toes as you order a drink and relax in to a hammock or a special bed with comfy pillows, enjoying the company of a good book or chatting amongst friends and family. Palm Beach with an envious beach front location is a delight for breakfast, lunch and dinner. Choose from freshly made croissants, delicious deserts imported from Italy, fresh seafood, pizza and pasta for dinner. There are two lounge areas for cocktails and appetizers, happy hour is during sunset with Champagne, European beers, wines and spirits. As the sunsets, Palm Beach is transformed with atmospheric lighting and becomes a wonderful place to enjoy Pasta, Pizza, Sushi, Sashimi, Lobster and fresh fish of the day. The speciality deserts are a real family treat, enjoy a freshly made cake or choose from the mouth watering Ice cream selection. Palm Beach is a fashionable venue with a relaxing tropical atmosphere, located directly on Santa Maria beach.